Peeler Crab, a dangerous bait! Warning: Peeler Crab can be a danger to your fishing tackle. Let me tell you a story of woe! I decided to get some Peeler Crab from the tackle shop on Wednesday to try for some Plaice and Smoothhound. Stupidly as I was setting up my gear I must have knocked over my box of crabs and all but one escaped. Unfortunately that single crab did not attract any of my target fish. This set me to thinking; maybe I should go and collect my own and make a video on how to do it. So thats exactly what I did. I called Gavin, our man behind the lense to meet me yesterday. We had a successful filming session, so expect to see a new video over the next few days. The bonus out of the filming was I now had some fresh Peeler Crab to go fishing with. I set off to Checkpoint, a mark near the Portland end of Chesil, in the search of a Smoothound, or even a Ray. I decided to go light, and only take my Any Fish Any Where rod, a Penn 525 Mag reel, tripod and a few rigs and weights. Once I had baited up, I cast out the bait to around a 100 yds. After letting the bait come round in the tide, I tightened down on the rod and stood back to see if it would settle, or if I would need to tighten down on it again. Without warning the rod shot out of the tripod, knocking it to the deck. The rod shot towards the water like a missile and within seconds it was gone. Being very experienced, I had the drag set for a Smoothound and I was standing next to the rod, as I always tell my clients to do when using Peeler. I spent half an hour casting, trying to snag it, as most rods that go into the water don’t travel far. Alas nothing. I have seen Smoothound pull rods into the water before, but this was so fast there was nothing I could do. Should anyone find it washed up please let me know. Pretty sure it was a Tope that hit it. The only other UK fish I know of other than a shark that could do that is a Stingray, but they are not not known on Chesil. It is a case of being double annoyed, not only did I lose good fish, but I lost my distance casting rod, which I had just replaced the tip eye on. My Century Tip Tornado, which is my prefered rod is currently in for a rebuild, so I am now rodless as far as distance casting rods are concerned. 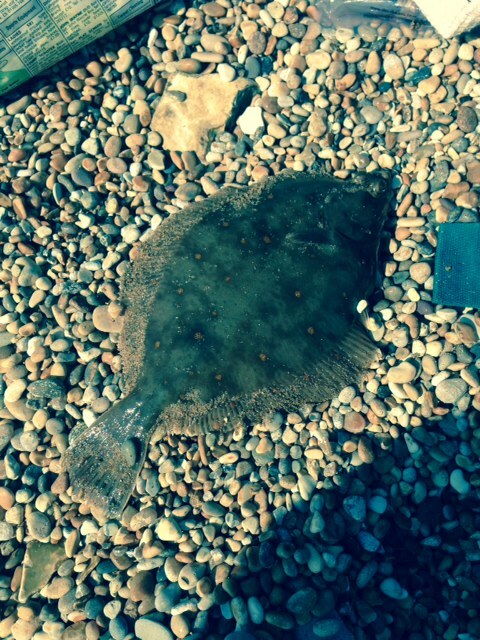 Normally I would not be so bothered, but there are lots of Plaice on Chesil at long range. so what lessons can we learn from this? For me not a great deal really, as I had done all the right things, but If you are using a Peeler Crab, or another large bait make sure you set your drag to a light setting, and if you have it engage the ratchet. If you engage the ratchet you can loosen your drag off even more without the fear of an over run if a large fish does take it. On to a more interesting note, since the tides have died back a bit, the Plaice fishing has been really good on Chesil. 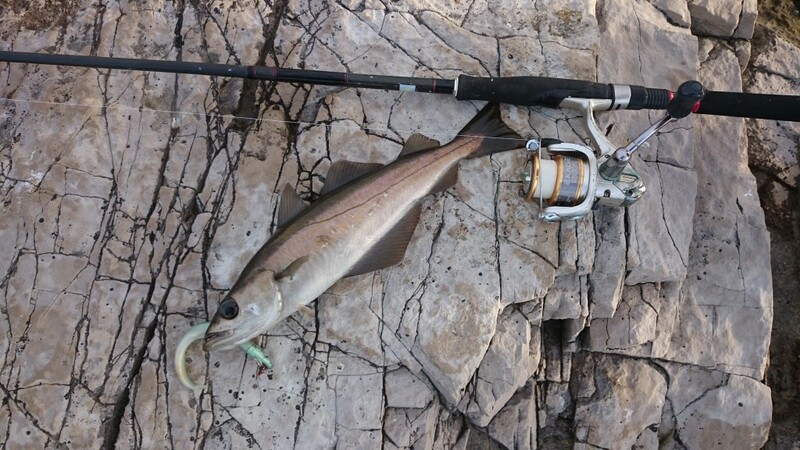 Ben Hackett, who sent in the picture below was amongst quite a few that landed some decent fish from the Abbotsbury and Cogden end of the beach. It is not just the shore that is picking up. Luke Pettis, skipper of Snapper out of Weymouth has been proving that the Shambles is fishing well again. 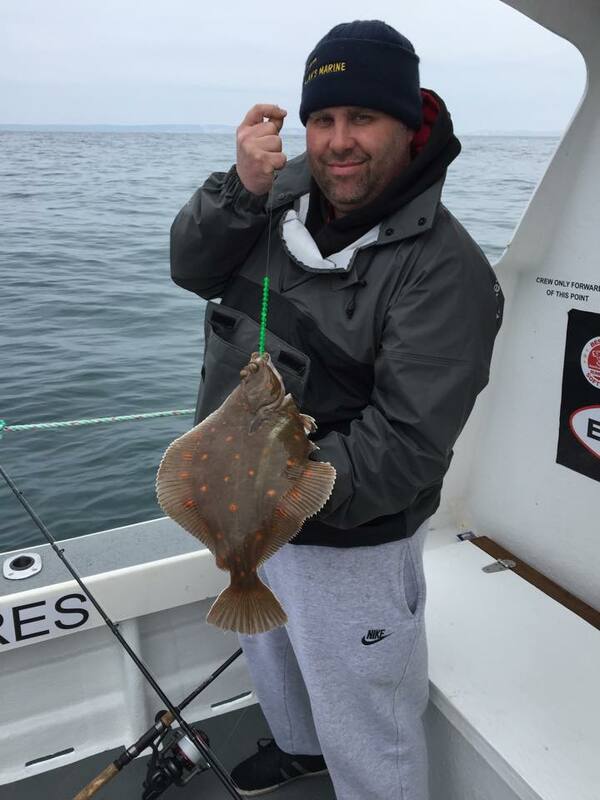 He managed a mixed bag of good sized Plaice, Turbot and Brill. Chesil Beach forecast: This is a great set of tides for Plaice fishing this weekend, although you will have a bit of wind to contend with. As I said in my report earlier in the week, try and get away from the crowds to give yourself the best chance of getting a Plaice. The Mackerel are still thin on the ground, but they are around. Portland Harbour: I spotted a lot of anglers fishing Portland Harbour and around Ferrybridge. I asked a few if they had managed anything, and apart from a small Wrasse, they all blanked. Weymouth Bay: Plenty of action from the piers, with Pout, Wrasse and even some Mackerel being caught. Please note that you are not allowed to feather for mackerel from the pier. It is unsafe for other users. I know that traditionally we see Squid being caught around November. However I know that there are plenty of Squid being caught from Brighton, which is not unusual in April. I wonder if it is worth giving it a go from the piers? 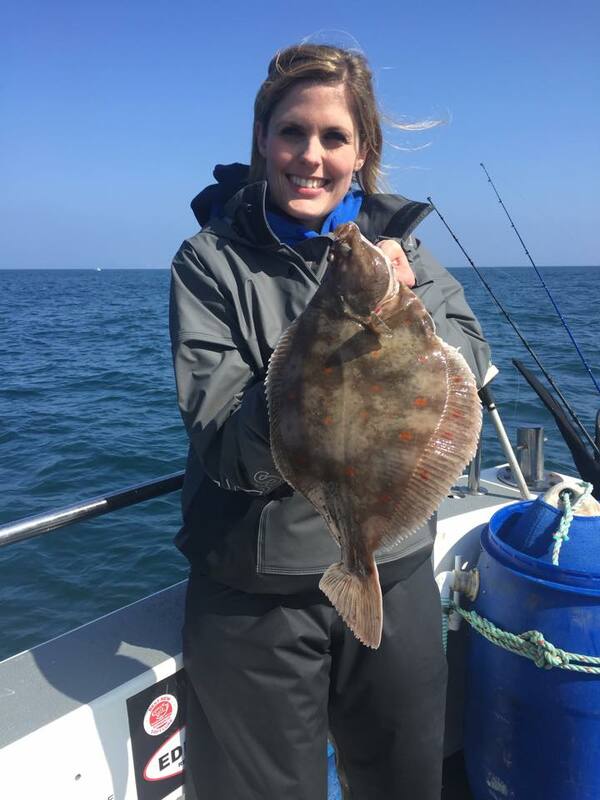 Guiding: I am now taking bookings for plaice trips as well as some basic fishing workshops for the next month. In the workshops I teach all sorts of skills, that will give you a good grounding for your fishing adventures for the rest of the year. I am happy to do lure or bait sessions and the workshops are 2 hours lonng and limitied to 3 people. 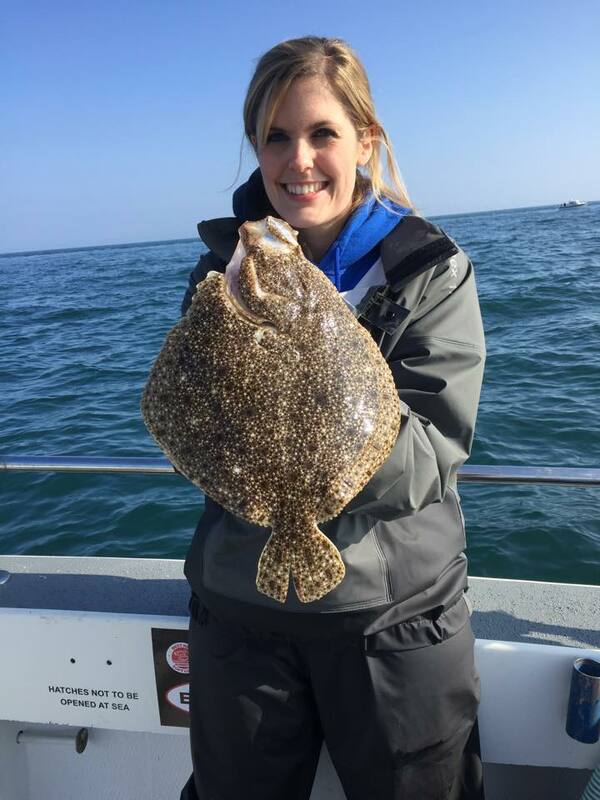 If you are thinking about booking a guided lure or bait session for the later on in the year, then now is the best time to do it, to grab the best tides. Fishing Tails > All Articles > Reports > Peeler Crab, a dangerous bait! 9 Responses to "Peeler Crab, a dangerous bait!" Hi Sean, what i love about your posts (apart from the fact that im stuck behind my desk working, and its a welcome relief ) is that we get the whole story, warts and all. Its not just how you had such a great day and caught loads of big fish. Your honesty makes this credible, varied and interesting. Although a lost rod is far from ideal, its living proof that we can all make mistakes and a gentle reminder to remember some basics. What is your Any Fish, Any Where rod? I m after one of those! I hope you get your rod back Sean.If anyone deserves it.you do with the amount of work and information you give out through your site.I will be bringing the Boat down to Portland in the next few weeks. Weather permitting.So if you fancy a day out.I will give you a shout. I was feathering up at Chesil many years ago and the same thing happened to the guy fishing near to me – there was an almightly splash on the surface from some form of Shark, and his rod dissappeared rapidly down the beach never to be seen again. Maybe a Portbeagle or Thresher chasing the Mackerel that got caught up? Maybe too early. I would love to see the pics Dave.